Those tired of bulky gym duffle bags will love these work to gym backpacks with built in shoe compartments. These backpacks allow you to take on your day in style with features such as laptop sleeves, generous main compartments and dedicated shoe storage. Keep reading below for an in-depth review of each backpack on the list. A backpack with shoe storage makes transitioning from your work or school clothes to your gym gear easier than ever. Not only can these separate compartments be used to carry your shoes, but they can also double as pockets for dirty laundry, towels and other gym items you may want to keep separate. This versatility gives you the freedom of going to the gym at anytime during the day without having to lug around a separate gym bag. What is a work to gym bag? The Solo Everyday Max backpack is perfect for those who need a backpack with a shoe compartment that has the features to adapt to work commutes, gym days and overnight trips. Some of it’s best features include double access to the main compartment through the top or font, dedicated iPad and laptop sleeves and of course it’s shoe compartment found at the bottom of the bag. The backpack also features side handles for easy carry when on the move. The Solo Everyday Max’s roomy main compartment and separate bottom pocket makes it perfect for those looking for a work to gym backpack with a shoe compartment. The dedicated tech pockets for your laptop and tablet allows you to carry all your work essentials while still having room for your gym items. Easy access pockets on the front and side are perfect for smaller work items such as business cards, tech accessories or eyeglasses. Athletes in college or high school will be pleased with how the Solo Everyday Max actually makes a great sports backpack with shoe compartment. The main compartment is large enough for textbooks and notebooks while the bottom compartment can store shoes or extra clothing. Solo designed the Everyday Max backpack to allow you to carry one or two days worth of clothing in it’s main compartment. The main compartment can be accessed by a 3/4 clamshell zipper that allows you to have full access of the main compartment. Padded handles on the top and side of the backpack allow for one handed carry. Those looking for a versatile backpack that can also be used for light travel will love what the Solo Everyday Max backpack has to offer. Unlike other gym backpacks, the Solo Everyday Max has tons of room for more than just your gym items. The bag allows you to carry a whopping 35 liters and has tons of pockets for small items such as sunglasses, phones and keys. The main compartment can carry 1 or 2 days worth of clothing but can also be filled up with your daily change of clothes, towels, meals and other gym essentials. If you are looking for a bag to use for work or school than you’ll love the additional storage for daily essentials. The Solo Everyday Max backpack includes huge fully padded laptop compartment that can hold a laptop up to 17 inches. The bag also features a separate tablet pocket for iPads and other electronics. Carrying books or documents should be no problem in the main compartment which has enough room for multiple textbooks, notebooks and documents. Solo did a great job at designing a backpack with a shoe compartment that doesn’t look too sporty. Many gym bags with shoe compartments can make you look like you are on an Olympic Soccer team with their bright colors, mesh pockets and polyester materials. Don’t get us wrong, there is nothing wrong with going with a “sporty” look but many gym bags do look out of place at the office. The Solo Everyday Max is toned down enough where it still looks great during your daily commute but roomy enough inside to carry everything you need to get through a day at work, school and the gym. Under Armour does a great job at designing stylish backpacks with athletes in mind. Their Undeniable 3 pack makes a great gym backpack for anyone who needs lots of space for their daily essentials and their sports gear. Not only is the front shoe compartment large enough to hold up to a pair of men’s size 12 sneakers, it is has enough room to hold a size 5 soccer ball or even an NBA-sized basketball. 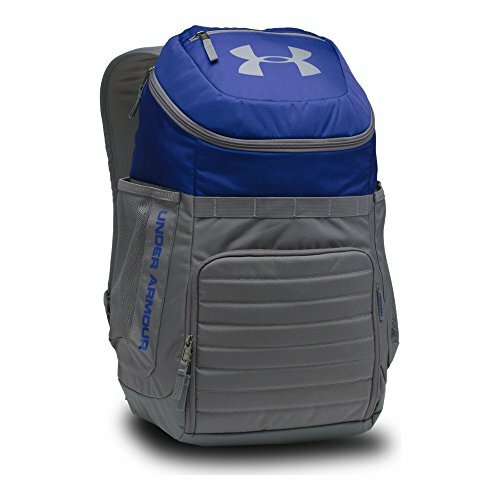 For those who need a bag for work or school, features such as a padded laptop sleeve and organizational pockets make the Under Armor Undeniable 3 a great work to gym backpack option. 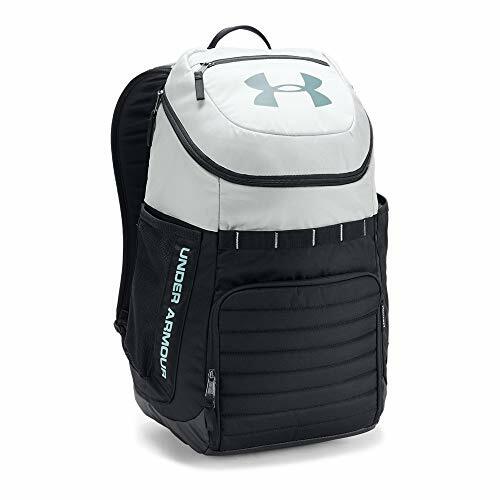 If you are looking for a smaller backpack with similar features then make sure to check out the Under Armour Hustle 3.0 backpack with shoe storage. The Undeniable 3.0 is one of our favorite backpacks with a shoe compartment because of its large storage capacity (31 liters) as well as Under Armour’s impressive attention to detail. On the outside of the backpack you’ll find tons of small design tweaks that make the Undeniable 3.0 a workhorse of a backpack. One of our favorite examples is the single row of webbing loops on the front of the bag that acts as an attachment point for molle pouches or a carabiner accessories such as keys and a flashlight. Although not necessary, having functional webbing loops is great to have. Other details we enjoy include the water-repellent front pocket that keeps stuff like wallets, phones, and watches safe from the elements. And an ergonomically design back panel that is foam padded for comfort. Two mesh side pockets are present on each side of the bag for easy storage of water bottles and umbrellas. Those who are usually tough on their backpacks will be pleased to know that Under Armour designed the Undeniable 3.0 with toughness in mind. The bottom panel is made of an abrasion-resistant material that can withstand harsh surfaces that may wear down the bag material such as concrete. There are also foam reinforced panels to add protection to the contents inside of the bag. Under Armour makes some of our favorite sports backpacks thanks to their attention to detail and dedication to making functional bags for real athletes. Anyone looking for a soccer backpack with shoe compartment or a basketball backpack with shoe compartment will be pleased to know that the Under Armour 3.0 can fit a size 5 soccer ball or an NBA-sized basketball without issue. Unlike other bags with bottom loading shoe compartments, the Undeniable has a front loading shoe pocket. We like the front loading feature as it makes accessing much easier by allowing you to access what is inside even when the backpack is upright on the ground. Along with being easy-access, the shoe compartment is also large enough to fit a pair of men’s size twelve sneakers. 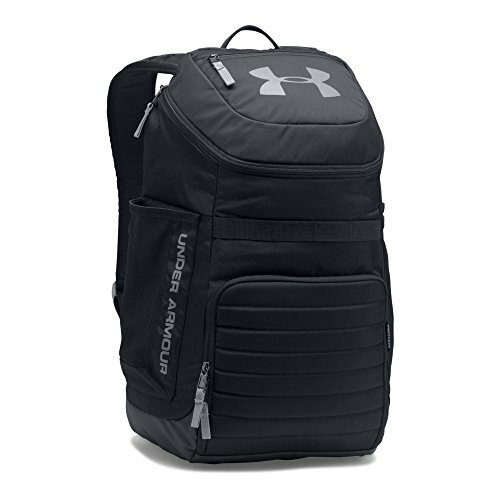 The Under Armour Undeniable 3.0 is an ideal work to gym backpack for those who need a large enough backpack for their work essentials as well as a change of clothes and shoes for the gym. It also makes a great backpack for students thanks to its large main compartment that can easily hold textbooks, notebooks and more. We appreciate the small details that make the Undeniable 3.0 such a great daily carry backpack. It features a nice sized laptop sleeve in the main compartment that can hold up to a 15-inch laptop. The laptop sleeve is soft-lined to protect your laptop against scratches. For smaller accessories, the Undeniable 3.0 includes an organization sleeve with pockets in the front panel. Additional pockets can also be found on the top lid of the main compartment. The Lifeasy Roll Top backpack is perfect for anyone looking for a budget backpack with shoe storage. The backpack itself is a roll top style backpack with a generous main compartment that can fit everything from books and notebooks to spare clothing. Shoe storage can be found on the bottom zip compartment that keeps your shoes separate from the rest of the contents inside. In the back you’ll find both a hidden pocket for important items and a side-access laptop compartment that can fit laptops up to 17 inches. Lifeasy offers a backpack that is full of features at a budget price of under $40. But just because this backpack has the cheapest MSRP on the list doesn’t mean that it’s not worth a closer look. Lifeasy offers great options for tech carry, with a padded laptop sleeve and a small front pocket for phones and chargers. We also like the roomy main compartment and completely separate shoe compartment (more on that below). Combine these features with a water resistant exterior and an anti-theft design and you have a great value for the price. One of the best features of the Lifeasy Roll Top backpack is the fact that the shoe compartment can be kept completely separate from the main compartment. With many other backpacks, the shoe compartment is nothing more than piece of material that separates the shoe pocket from the main compartment. This means that the bigger your shoes, the less room you have for other items in your main compartment. This isn’t the case with the Lifeasy Roll Top backpack which is designed to have the shoe compartment in it’s own bottom area instead of sharing the main compartment space. The minimalist design of the Lifeasy Roll Top backpack is one of the reasons we decided to include it in this list. The design is simple, understated and mature enough to wear to work without it looking to “sporty”. The Lifeasy Roll Top backpack is available in black, light grey and a darker heather grey. We love the Lifeasy Roll Top backpack as a the ideal work to gym backpack for those who need a resilient pack to get them through busy commutes and hectic days at the office. The bag is made of water resistant polyester fabric which is perfect for commuters who may get caught in the rain. For those who need to carry their tech with them, the bag features a side access laptop compartment that can fit a laptop up to 17 inches. This design allows you to grab your computer without having to rummage through your main compartment. We also like that Lifeasy designed a USB charging port into the side of the bag which allows you to charge your phone while on the move. The Lifeasy Roll Top backpack also has a ton of security features designed into the bag that make carry on trains and buses a lot safer. There is a hidden pocket on the back of the backpack that can be used for valuables such as money, passports, wallets or train/plane tickets. The roll top design also acts as an anti-theft feature as you need to undo the roll and then unbuckle it to access the contents inside. The State Lenox backpack is perfect for anyone looking for a stylish backpack that doesn't look too sporty yet can be used as a work to gym bag. This backpack will look great when carried during work or school days but has all the features you need to hit the gym. The side pockets can be used as water bottle pockets while the front stash pockets can be used to hold smaller items like keys, phones and wallets. The main compartment is large enough to carry a laptop, boots and your daily essentials. The bottom of the backpack is where you will find the shoe compartment which can fit shoes up to a men’s size 13. We love that the shoe compartment is separate and out of the way allowing more room for your daily gear. We recommend the State Lenox bag to anyone who appreciates stylish design with an emphasis on quality materials and build. State created the Lenox as a work to gym backpack for professionals who don’t want their backpack to scream “gym bag”. This office appropriate backpack is made of a water resistant coated canvas with a polyester lining for safe commutes even when the weather is crummy. With the Lenox backpack there are no bright sports colors or edgy tactical webbing. What you get is a simple and mature work to gym backpack with a shoe compartment. Oakley offers big features in a small footprint with their Link pack. The backpack is designed to be as lightweight as possible while still providing great options for storage. We like the Link backpack as a work to gym backpack because of it’s integrated tech storage that allows you to carry all of your work items while still having enough room for workout shoes or clothing in it’s dedicated shoe pocket located on the bottom of the bag. Features like reflective visibility strips on the front, a generous 29 liter main compartment and an opening for a hydration tube make the Oakley Link pack a multifunctional backpack that can be used everywhere from the office to your next weekend hiking trip. Oakley does a great job at incorporating convenient tech carry in such a versatile gym backpack. The inside of the main compartment is where you will find a sleeve that fits laptops up to 15 inches. This laptop compartment can also be accessed through a zipper on the side of the bag for convenience. Along with a laptop sleeve, Oakley includes a separate tablet pocket and plenty of pocket space throughout the bag for tech accessories such as chargers, cables and portable batteries. We like the Oakley Link pack for work commutes or for long days on campus. It’s perfect for anyone looking for a low profile backpack with a bottom compartment for shoe storage. Its slim profile allows for easy wear on crowded commutes like subway trains or city buses. Oakley includes reflective strips on the front of the pack for safety while wearing at night. The polyester material is also water resistant and can keep your valuables dry. Although this bag isn’t fully waterproof, it can be safe to wear during light showers. Then there are the great comfort features that Oakley has designed into the bag. The back of the backpack is made with a padded mesh that prevents a sweaty backs on hot days. The shoulder straps are also padded and ergonomically designed for comfort. Lastly, a chest harness helps with stability when the backpack is fully loaded. In addition to being a great gym and work bag, we also like the versatility of the Oakley Link pack to be used as a travel and outdoor backpack. Think hiking, biking or trail running. The side pockets make it easy to stow away small items such as snacks, water bottles or your phone. We also like Oakley’s decision to add a hook and loop inside the backpack with an opening for a hydration port. This little feature allows you to stow away a hydration bladder in the laptop compartment to use on hikes and runs. The main compartment is actually very generous and has enough room for a laptop, clothes, and other daily essentials. Anyone looking for a Nike backpack with a shoe compartment will be pleased to find a perfect match with the Nike Sport III Golf backpack. Nike designed the Sport III Golf backpack for golf enthusiasts who need room for their golf shoes, towels and water bottles while out on the course. But this is more than just a golf backpack. In fact, we think the Sport III Golf backpack is perfect as a work to gym backpack thanks to it’s large main compartment, easy access zipper design, and a roomy shoe compartment that can fit everything from workout shoes to a change of clothes. Take a closer look at the Nike Sport III and you’ll notice a few key design features that make this backpack a clear winner. One example is how Nike made the bottom compartment of the bag out of a moisture resistant material. This is beneficial to golfers who may need to place their bags on wet bags on the course. But it is also a nice feature to have for those of us who may workout outside. The shoe compartment is located at the bottom of the bag which is typical of a shoe compartment backpack but where this Nike backpack differs is that it’s a completely separate storage area that doesn’t cut into the main compartment. This is a huge plus for a sports backpack with a shoe compartment as it leaves extra room in the main compartment for your everyday essentials. Unlike other sports backpacks with shoe compartments, the Nike Golf III has a mature and understated design that isn’t too loud or “sporty”. Nike even keeps their branding simple with just a single printed logo on the bottom shoe pocket. The Nike Sport III backpack is available in a few different colors but they all share the same simplicity. Colors include heather gray, black and a heather “thunder blue” with either black or red accents. It’s simple colors like these that make the Nike Sport III a great work to gym backpack that won’t bring too much attention at the office. Our top picks for women’s backpacks are simple; stylish backpacks that comfortably fit smaller frames. While the backpacks on this list are unisex in design and can be worn by just about anyone, it does make a huge difference to have a backpack that fits well. These backpacks are not only smaller in size but they are perfect for anyone looking for a women’s gym bag with a shoe compartment. At a slightly smaller size than the popular Under Armour Undeniable. the Hustle 3.0 packs a punch as a roomy backpack with plenty of storage and a clever shoe compartment that is accessed through the bottom of the bag. We love how the Under Armour Hustle 3.0 is large enough to hold your work or school essentials plus everything you need for the gym. This mid-sized backpack is perfect for those who need a stylish work to gym bag but don’t want to compromise on storage space. The Under Armour Hustle 3.0 is a backpack for those who need plenty of space for their daily essentials and some extras. The lofty 30 liter main compartment is large enough to store everything from books, extra clothes and lunches. It’s also a great bag for tech. The main compartment holds a soft-lined laptop sleeve that can hold a laptop up to 15 inches in size. There is also a soft-lined valuables pocket on the front that safely stows away valuables such as phones, headphones and other small items. We also really like the small details that make the Hustle stand out when compared to other similar gym bags. One example is the reinforced abrasion-resistant bottom of the bag that works against common tearing and ripping. Another cool detail is the addition of small attachment loops on the front of the bag that allow extra gear like carabiners and keys to be attached to the front of the bag. Under Armour is known for adding small details like these to their backpack designs that really add to the daily carry experience. The Under Armour Hustle 3.0 is perfect for both athletes with busy schedules and fitness buffs who need a reliable work to gym backpack with shoe storage. The shoe pocket on the Hustle 3.0 is located at the bottom of the bag and is large enough to hold a small pair of sneakers and some extras or one pair men’s sneakers up to a size twelve. There are multiple large compartments on the Hustle 3.0 so it’s easy to separate your workout gear with your school or work items. One the sides of the bag are two pockets that can fit water bottles, shaker bottles or even an umbrella. 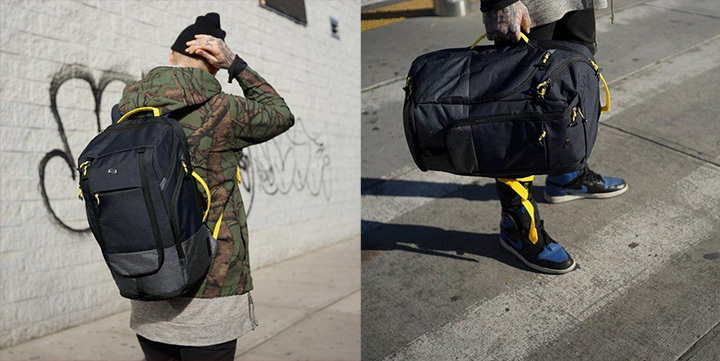 All in all the Under Armour Hustle 3.0 is the perfect gym backpack for those on the move. Amber & Ash offers a cute work to gym bag with shoe storage with their Everyday backpack. This backpack makes going from the office to the gym easier than ever with it’s built in bottom compartment and lofty main compartment for a laptop, gym clothes and other daily essentials. We love this backpack because it’s simple and doesn’t scream “gym bag”. It’s worth noting that this bag is on the smaller side which can be a pro or a con depending on how much you carry. The Everyday backpack by Amber & Ash is a simply designed backpack made for everyday carry to work, school or on weekend adventures. But we love it as a women’s work to gym bag with a shoe compartment thanks to it’s generous bottom pocket that can comfortably fit a pair of workout sneakers. Because it is separate from the main compartment, you can comfortably store stinky shoes or gym clothes in the bottom compartment without it affecting the rest of the contents in the bag. The main compartment is large enough to stow away a 15-inch backpack as well as plenty of books, notebooks and work items. As a gym backpack, it’s just the right size for a change of clothes and toiletries. If you like the idea of the Amber & Ash Everyday backpack but need extra room, then check out our budget option the Lifeasy Roll Top backpack which features a similar bottom shoe compartment design but with a much larger main compartment. The ultimate gym backpack with shoe storage is now available in a smaller size with the King Kong Mini backpack. This backpack was designed from the ground up as gym backpack and it really shows. Every compartment is made to utilized at the gym or at work. One of our favorite features is the front shoe pocket that allows your shoes to air out after a tough workout. The larger version of the King Kong backpack was featured in our best backpacks for crossfit list and we loved it so much we had to add the Mini to our list of favorite work to gym bags. The best part of the King Kong Mini is it’s functional design. 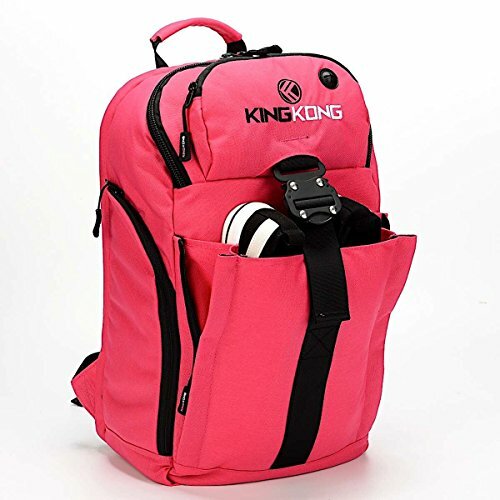 The King Kong Mini is small enough to be carried by people with smaller frames comfortably but has expandable compartments that allow you to carry extra items such as shoes and shaker bottles when you need to. A good example are the two zipper side pockets that expand out to be able to carry water or shaker bottles but then zip back neatly into place when not in use. We also love front pocket that expands out to fit a pair of shoes or a meal bag. If you are considering using the King Kong Mini as a work to gym bag then you’ll love the roomy main compartment that can fit everything from extra clothes to your work items. The main compartment also features a 15 inch laptop sleeve. The bag is filled with plenty of pockets for smaller items such as wallets, keys, and phones. The inside is lined in a brightly colored rip-stop nylon that allows you to easily spot items inside the bag. Those who have ever owned a dark unlined bag knows the struggle of losing an item into the abyss. King Kong thoughtfully fixes that problem. The most common shoe compartment backpack is a backpack with a bottom compartment. King Kong took a different approach to shoe storage and placed the shoe pocket on the front of the bag. The first thing you’ll notice about the King Kong shoe pocket is that it isn’t a zipper compartment. Instead the shoe pocket is held shut by a heavy duty buckle. This allows the shoes to breathe and not trap oder inside the bag. When not being used as shoe storage, the front pocket can also hold a meal bag or other larger items. At 17 liter capacity the King Kong Mini backpack is just the right size for those who only need to carry the essentials. The backpack can comfortably carry a pair of shoes, a change of clothes, a laptop and small essentials such as shaker bottles, sunglasses, and phones. When compared to the Under Armour Hustle backpack, 17 liters is much smaller than Under Armour’s 30 liter capacity. But for most women who need a gym bag with a shoe compartment it will be more than enough for the basics. When it comes to the backpack’s size, it’s perfect for smaller frames. At 18 inches in height, the King Kong Mini can comfortably fit someone under 5’6” with shorter torsos. Although there are many work to gym backpacks that have great designs that rival the King Kong Mini, they seldom are offered at this smaller size. The King Kong brand really shines in it’s commitment to offer the best quality gear for gym goes and fitness enthusiasts. The King Kong Mini is made out of an ultra tough 1000D nylon with heavy duty YKK zippers and rip-stop nylon lining. Even their front buckle is made out of carbon steel which has over a four ton breaking strength. Talk about built to last! Work to gym bags (or work to workout bags) are any bag that is designed to hold everything you need for the office and the gym in a single bag or backpack. The best work to gym bags have enough room for your work essentials such as laptops, notebooks and accessories while still being able to store your gym items such as shoes, water bottles and a change of clothes. Most people go for bags that are office friendly in terms of style and color but still have athletic bag functionality such as water bottle pockets and laundry compartments. We really like brands like Solo and State for those who want a toned down in their work to gym bag. If you don’t mind a more athletic look to your work to gym backpack then we recommend checking out brands like Under Armour and King Kong who both offer some great options built especially for athletes and gym enthusiasts. Work to gym bags can come in a variety of styles. The most common are duffel bags and backpacks. In this list we focused on the best work to gym backpacks because they are versatile, compact and would be a good fit for most people. There are three common types of backpacks with shoe compartments and each one is a little different. Below is a helpful explanation of each type so you know the difference when shopping for a new backpack. Front access backpacks have a front loading shoe pocket that is separate from the main compartment. The main compartment and shoe compartment is usually divided by polyester or nylon material. 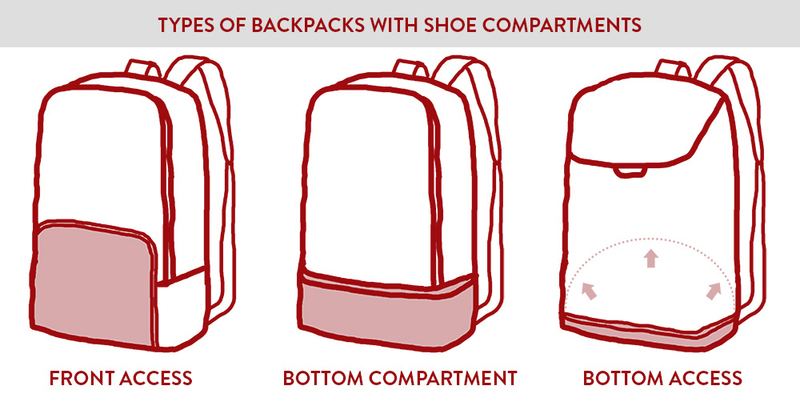 Some backpacks do a good job at separating the two compartments but others may take up space in the main compartment if the shoe pocket is filled. A good example of a front access shoe compartment backpack would be the Under Armour Undeniable. Many people prefer shoe compartments with front access because they can retrieve their shoes without having to completely pick up the bag or lay it flat. Another pro of having front access is that the bottom stays flat when set down on the ground. Bottom compartments can make the bag bottom uneven when filled with shoes. Bottom Compartment backpacks place a compartment on the bottom of the bag that is completely separate from the main compartment. Unlike backpacks with bottom access or front access shoe compartments, a backpack with a bottom compartment does not dig into the main compartment as it’s being filled because it has it’s own reserved space. The best examples of backpacks with bottom compartments are the Lifeasy Roll Top backpack and the Nike Sport III Golf backpack. One thing to note with bottom compartment backpacks is that their main compartments may be smaller due to the addition of the bottom compartment. Bottom access shoe compartment backpacks usually have a zipper entry at the very bottom of the backpack that opens up to a shoe compartment. 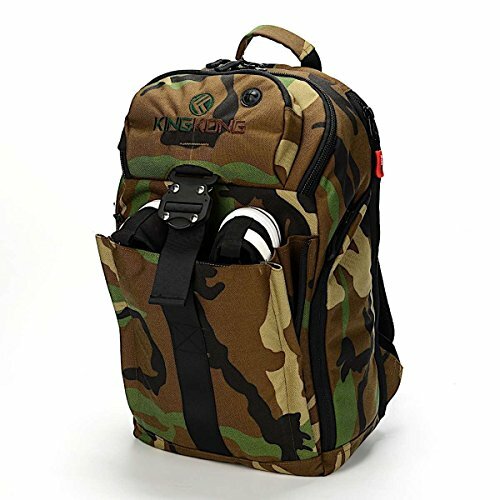 The difference between a bottom compartment backpack and bottom access shoe compartment backpack is that the bottom access bag share the storage space with the main compartment. Like front access shoe compartment backpacks. the shoe compartment and main compartment is divided by polyester or nylon material. A good example of a bottom access backpack is the Oakley Link Pack. With hundreds of bags to choose from we could only research so many backpacks with shoe compartments. Instead of going through each and every one we decided to set a standard in which each backpack must have before we further reviewed it. The first and most obvious criteria for consideration was that each backpack had to have a dedicated shoe compartment. Our list was not just of the best work to gym backpack but the best work to gym backpack with a shoe compartment! Every backpack must have dedicated storage for tech. This means laptop sleeves and compartments are a must. Bonus points were given to backpacks with extra pockets for tablets, chargers and cables. In today’s world, most people lug around some sort of tech to their jobs. The perfect work to gym backpack has room for your work gear as well as your workout gear. When it comes to backpacks, no one wants to own an ugly back. We took style into consideration when making our list and excluded any bags that were poorly designed or just not fashionable. Build quality is just as important as style. Backpacks with well constructed shoe pockets, high grade materials and built-in comfort features were put into a higher priority for consideration. We considered thousands of online user reviews and excluded any bags with too low ratings. Only backpacks with high user reviews were considered for review. We only included bags that are widely available in stores and online. This makes it easier for you to shop for a bag you like without having to worry about low stock or shipping restrictions. We excluded bags from some of the smaller backpack brands because of this. Instead we made sure the bags on our list are readily available at multiple retailers online and can easily be shipped within the US.